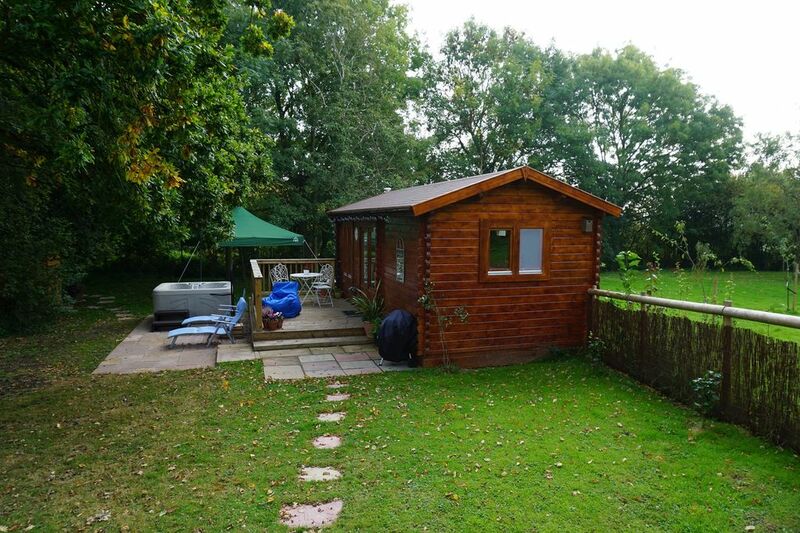 Self catering log cabin, 1 bedroom, dog friendly, near Leeds Castle. We are pleased to offer self-catering accommodation in a newly erected log cabin with a hot tub, built in the grounds of our 16th century home, with views of The North Downs here in Thurnham, Kent. The Cabin (23ft by 10ft) has been decorated and fitted out with a contemporary look and offers full heating throughout. The bedroom has a comfortable double bed, with an en-suite shower room. We provide toiletries, hairdryer, and a couple of towelling robes with matching slippers, just so you’ll feel pampered! And if you need it, there is a futon in the living room that can be converted into an extra bed. Enjoy even the chilliest of days at the cabin! Relax and soak in the scenery and local wildlife in the luxury of your own private hot tub. After a day spent enjoying the outdoors, you might want to relax in front of the television or just enjoy the flicker of the flames created by our instant-heat electric fire. If you want to prepare your own meals, there’s an oven, microwave and hobs. We’ll even arrange for a food delivery if that’s what you want and store it in the refrigerator ready for your arrival. Weather permitting, you will be able to sit out on your own private veranda that overlooks the North Downs and dine alfresco. You’ll find a barbecue in the shed we have provided, which can also house any bikes you might decide to bring. Fortunately, The Cabin is completely fenced, with its own entrance and land, so if you do bring a four-legged friend, you can all relax. We can advise you on local walks and cycle routes, even those including our wonderful local pubs! This area is steeped in history so you might perhaps choose to visit nearby Leeds Castle and find out why Henry VIII stayed there. The shops are a short drive away. If you are looking for a rural retreat, set at the end of a bridleway and surrounded by fields, why not use The Cabin as a base? Whatever your individual requirements – whether it be walking, biking or a romantic break - we will ensure a tailored approach to your stay, in a clean and well-maintained environment. Blu-ray player, electric kettle, toaster, small fridge freezer, boot warmer, ordnance survey maps, bed linen and towels included, battery operated torch, fold-away dining table, chairs and coffee table, Scrabble and cards. Sun loungers. Tea and coffee provided for arrival. Security deposit required. Utilities included. Sensible footwear is recommended (especially in the winter) as the cabin is reached along a grassy track. We have made the cabin as accessible as possible but the topography of the land limits access at some times during the year and steps are required. If you have limited mobility please telephone and we can talk you through the access ensuring you can be as comfortable as possible. Maximum of two people unless agreed prior to booking. No smoking in The Cabin or the veranda. Stunning location with beautiful views. Very clean and comfortable. Hot tub was the perfect size for the 2 of us. Had a lovely night away in this peaceful, cosy cabin. Hot tub was amazing, lovely little touches in the cabin just added to the welcoming vibe of the property. Thank you for taking the time to write a lovely review. very relaxing and unique cam back feeling refreshed. Everything in cabin spotless bed comfy and hot tub amazing would return! Beautiful! Great place to go and relax and have a romantic get away. Will definitely recommend!!!!!! Julie was very friendly and accommodating! Lovely place to stay. We felt very relaxed and the views were amazing. Would return again! Great place to stay if you love nature and want to get away from your manic every day life!